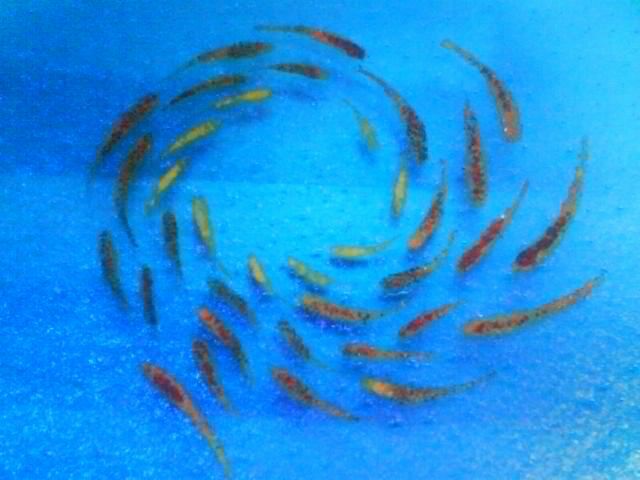 Golden fish gather on a turquoise background. Swirling and twirling like Autumn leaves. This piece has sold but I will happily make one similar to it. They are all unique and no two are identical. Beautiful fused glass bowl with hand painted fish. 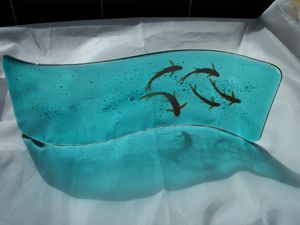 Made to order so that you can specify the shape (square or round) and colours of glass and fish. 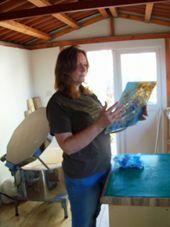 Welcome to my gallery where I design and create all my own fused glass pieces. 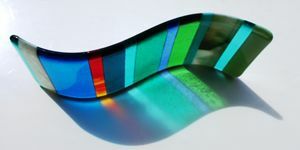 Fused glass is also known as kiln-formed glass as it is heated in a kiln to produce new and attractive items. There are a number of ways to push, prod and coax the glass to take on the final form. I tend to treat the glass like a painter uses a canvas and, with tiny bits of glass (called frit) I layer colour upon colour upon colour to create my design. This process is usually repeated at least twice in order to get the rich colours. Another firing achieves the final form: curved, square, round,etc. As every firing stage takes approximately 8 hours it is a long process from conception to the end result with many failures along the way! Most of my work is made to order so that colour preferences can be decided by the customer. Most of what I do is not only decorative but also functional as tableware. If you would like to commission you own piece or you are curious about the process please contact me. I hope you enjoy looking!